In July, Earl Hastings was named director of the new Securities Division. He knew the scandal-prone mining industry well and realized what was required to bring it within the purview of a new securities law. (15) His first step was to draft legislation. Hastings wanted a law strict enough to deter criminals while allowing legitimate firms to raise capital. He turned to the U.S. Securities and Exchange Commission for help. 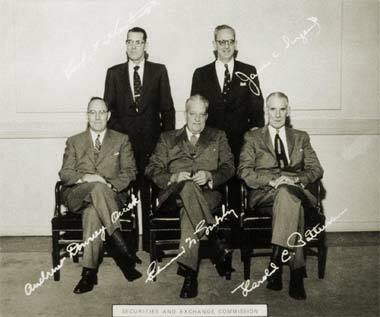 In fall 1949, Hastings asked the SEC’s San Francisco office for copies of the securities laws of other states, believing that examining these laws would inspire “a fair and enforceable code suitable to the conditions existing in this State.” The regional staff provided them and also referred Hastings to the Rayburn Committee Report, that preceded the enactment of the Securities Act of 1933, and the 1939 Uniform Sale of Securities Act. Hastings also consulted with Anthon Lund, SEC Director of Trading and Markets, and Milton Kroll, SEC Assistant General Counsel, at the SEC’s headquarters in Washington. This close cooperation of Arizona with the SEC produced legislation ahead of its time. The Arizona Securities Act was among the first to include exemptions for SEC prospectus materials and securities listed on SEC-regulated exchanges. The Arizona statute pointedly mirrored federal securities laws in order to ease enforcement cooperation and “achieve maximum uniformity.” While Hastings’ original bill had only civil remedies for those purchasing securities, the SEC recommended adding a civil liability that would apply to both sides and “track the act’s anti-fraud statute, which made it a crime to defraud either a seller or a purchaser.” (16) Arizona became the first state to institute such clauses. The Riccardi affair luridly illuminated the need for sweeping securities law reform. In the decades since the Blue Sky Law, not only had Arizona modernized, but so had the markets. Now, there were precedents to draw on, and a national securities regulator in the SEC. The 1951 Arizona law demonstrated an effective combination of state-level activism and national-level expertise to create a workable, enforceable, and palatable law. (14) New York Times, “Arizona to Inquire into Mining Concern,” June 13, 1948. Tucson Daily Citizen, “Riccardi Firm is Condemned,” September 17, 1948. Tucson Daily Citizen, “Riccardi and Pair Accused by De Concini,” December 14, 1948. (15) Quoted in Yuma Daily Sun, “What Other Editors Are Saying,” March 3, 1949. Hearing on the Nomination of Earl Freeman Hastings, February 16, 1956, 3. Himelrick, Richard, “Turning 60: Bud Jacobson, Earl Hastings, and Arizona’s 1951 Securities Act,” Arizona Attorney, December 2011, 24. (16) Himelrick, “Turning 60,” 25. Hearing on the Nomination of Earl Hastings of Arizona, February 16, 1956, 3. (17) Himelrick, “Turning 60,” 24-26. Yuma Daily Sun, “Gov. Pyle Signs Blue Sky Bill,” March 7, 1951.